As an agricultural scientist, you will be at the forefront of scientific discoveries behind modern agricultural developments to respond to the world’s need for food and fibres. With worldwide demand for food rapidly increasing, agricultural science is a major area of importance to our economy and offers high employment prospects for graduates, with two or more positions available for every university graduate. As an agricultural scientist, you will apply your knowledge to solve major challenges such as climate change, food security and the sustainable production of food and fibre for global consumption. With 50 per cent of agricultural positions in Australia located in metropolitan areas, agricultural science offers exciting, challenging careers across a wide range of sectors including in government, industry, and international institutions. I am a Produce Field Officer at Harvest Freshcuts (a part of OneHarvest) in Brisbane, which is a leading Australian produce company, making pre-packed salads and stir fry vegetables, mainly for major retailers. In my role I am responsible for ensuring that all raw materials brought on to site arrive on time and are of the highest quality standard. I conduct on-farm quality and quantity assessments of baby leaf salad leaves (for example, spinach and rocket) and whole head hard vegetables including lettuce and cabbage. 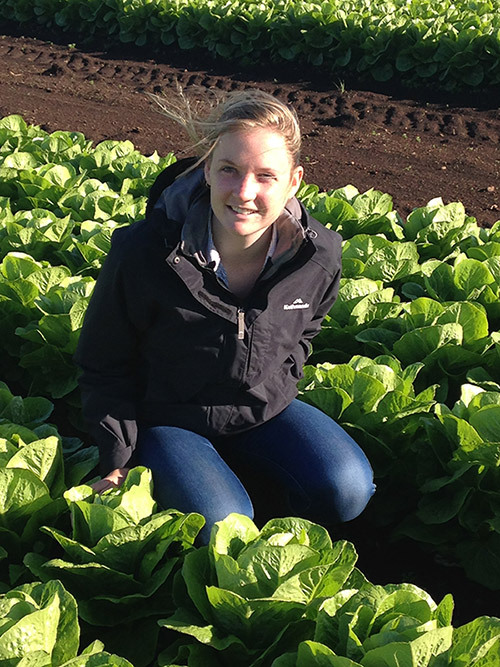 As a part of my Bachelor of Agricultural Science at UQ, I became involved in the production horticulture industry and I tailored this degree to suit my interests and goals of starting a career in this sector. I also studied a number of business subjects as electives within my degree and this has helped significantly in understanding the scope of a company such as OneHarvest as well as forming and maintaining relationships with a wide range of growers. I studied a Bachelor of Agricultural Science (Honours) at UQ. I was lucky enough to find a job in my final semester of university. Ag Science is a degree that is applicable to a wide range of jobs – not just farming – and this means that the job availability is extremely broad with a lot of potential to gain a grad position. Although I did not start my career in a job directly related to my degree, my background and transferable skills were highly beneficial and I believe that my qualifications were recognised by my employer. Whilst studying at UQ, I worked as a quality assessor on a local baby leaf farm which was incredibly useful in securing my interest in the production horticulture field. I started my career at OneHarvest as a buyer/production planner and this enabled me to form a great knowledge base of the business before moving into the produce department. My job enables me to work in a wide range of locations and circumstances as I spend time in the field as well as on site at the factory. This change of environment means that I am continually challenged and stimulated and I am able to communicate and work alongside a wide range of peers, from growers to seed representatives to account managers. Working in a nationwide company means that there is an increased scope for travel and subsequently the ability to increase my knowledge of different horticultural regions throughout Australia. A highlight of my experience at UQ was being named as the Valedictorian for my graduating class in 2013. It was a great opportunity to thank my peers for their support over the previous four years and to pay respect to the effort that everyone had contributed towards succeeding in their degrees. Within my role at OneHarvest I have been able to travel throughout the east coast of Australia, visiting multiple business sites and horticultural production regions. There is a vast difference in farm management and production throughout Australia and it has been a great experience to gain an understanding of just a few regions. I would recommend doing your research. I attended the FEAST program at Gatton when I was in Grade 12 and this really helped me decide between a Bachelor of Agribusiness and Agricultural Science and also confirm to me that I was happy to spend 4 years in a non-metro region. I spoke to recent graduates as well as people currently studying my intended course and got as much feedback as possible. Ultimately though, I went with my gut feeling of what I wanted to study and I knew that due to its broad scope, my degree would lead to a job opportunity at the end of my course.